These super-tasty snacks are high in fibre and really easy to make. They will keep for at least two weeks in the fridge, but they will probably all be eaten long before then! Blend the walnuts and cashews in a food processor until they’re like fine breadcrumbs. Add the dates, cacao powder, coconut oil and vanilla and blend until super-smooth, like toffee. Using damp hands, roll the mixture into small balls. If you wet your hands with cold water, the caramel won’t stick to your hands as much. Set aside. Melt the chocolate in a heatproof bowl set over a pan of simmering water or in the microwave. 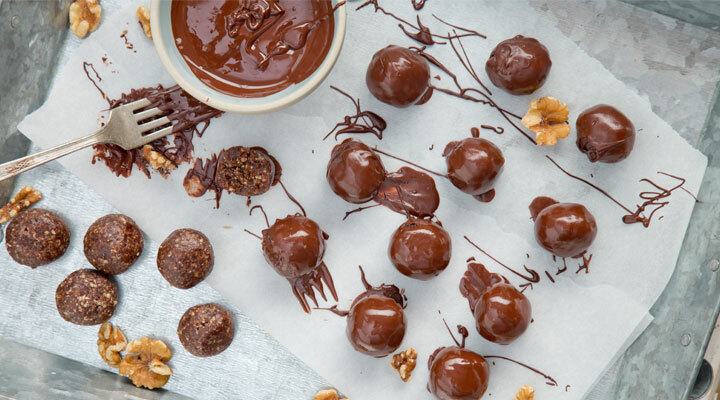 Using two spoons, dip each caramel ball into the melted chocolate, making sure to completely coat each ball. Place on the lined baking tray and repeat with the remaining balls. Put in the fridge and leave the chocolate to harden. Once the chocolate has set, store the balls in an airtight container in the fridge for up to two weeks.